Following slow start to season, Maine Maple Sunday's temperature hit the ‘sweet spot’ to collect sap. PITTSTON — Lynn Chadwick and her family started making maple syrup with a propane boiler and a lobster pot nearly a decade ago in Pittston, lugging every bucket by hand. The Chadwicks still lug every bucket, but now they boil their sap in an evaporator before moving it to the wood stove top to get it just perfect. Chadwick’s Maple Craft Spirits is a small operation with around 100 taps producing 20 to 30 gallons of syrup a year, which is they use to make their triple-distilled maple craft spirits. 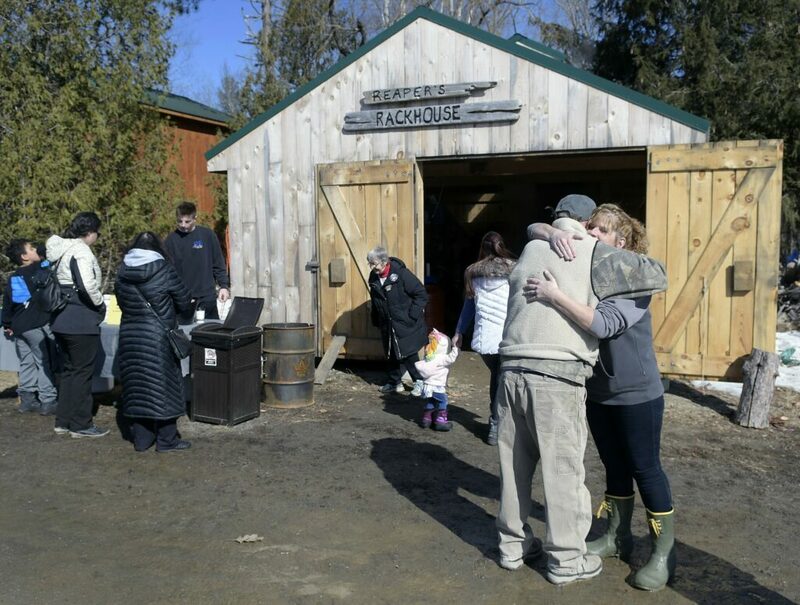 Those spirits might have been part of the draw to visit this sugar shack on Maine Maple Sunday. Chadwick was working the evaporator and giving samples of pure sap — straight out of the tree — and sap a third of the way boiled off out of the evaporator. 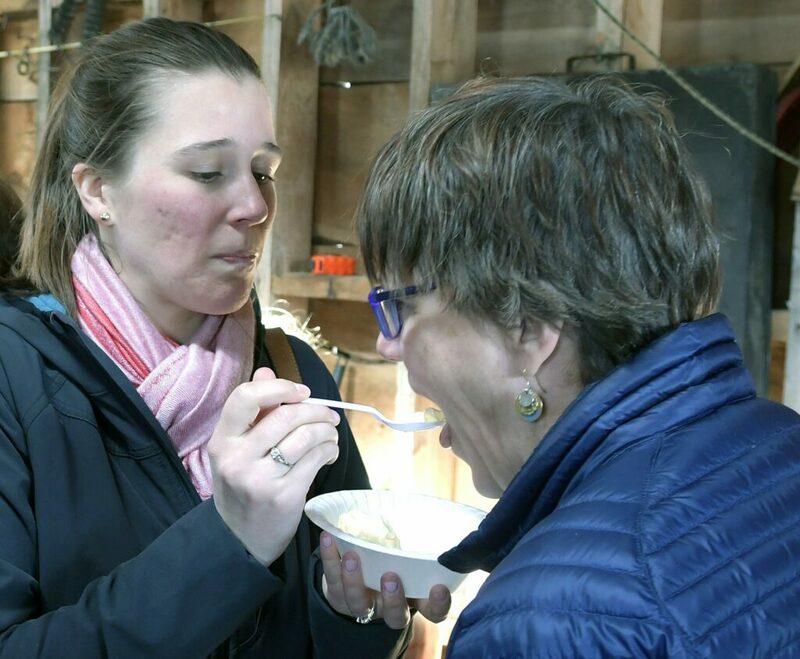 “It’s nice,” said Jaime Allie as she tasted the unboiled sap. “I expected it to be thick and gooey and weird. Allie was part of a group of four people on a Maple Sunday tour. A resident of Lewiston, she said that in previous years she’s visited sugar houses close to home, but this year she wanted to see what other houses were out there. This was the second time the Chadwicks participated in Maine Maple Sunday; this year was the first year they advertised it. Along with providing samples of maple and spirits, they also offered maple pizza by Steel House Oven. This maple recipe was brand new for Steel House Oven owner, Stacy Boudreau. While she had imagined it, she hadn’t tasted it until yesterday — and knew it would be perfect for Maple Sunday. “I was really skeptical to give away pizza I’d never tried, but in my head, I knew it would be very good,” Boudreau said. The pizza was oil-based, rather than with tomato sauce, and topped with buffalo milk mozzarella, ricotta, brown sugar roasted butternut squash, bacon and maple syrup produced by the Chadwicks. 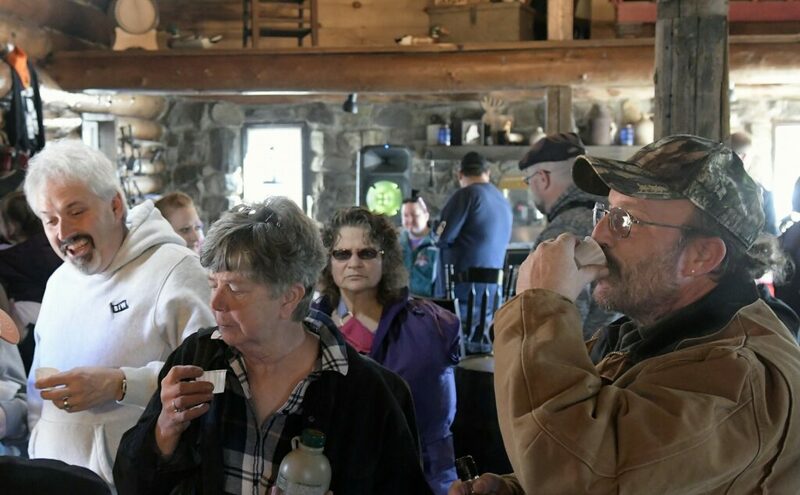 The family-owned Mike’s Maple House, in Winthrop, also participated in Maple Sunday. Mike Smith said his syrup has been tasted around the world, including Japan and Africa. Most of his customers are local, though. “If steam is coming out of the sugar house, we’re open,” Smith said. Smith said he’s had many repeat customers for Maple Sunday, which he has been participating in for around 15 years. The Siniak family has been attending the maple house each year since moving to Winthrop three years ago, Emilia Siniak said. Her children Teresa, 16, and Adam, 13, enjoyed maple syrup on pancakes and ice cream, while Emilia liked to have it in ice tea. Her youngest child, Elizabeth Brown, who was 13 months, was experiencing her first Maple Sunday experience. Smith said he recognized many families, but some were new. Friends Lila Begin and Harper Stasulis, who are both 8 years old and students in the same Winthrop Elementary School class, said they were learning about making maple syrup. “It looks like the house that was in the book,” Lila said. Lila; her younger sister, Chloe, 3; and Harper all agreed that their favorite way to eat maple syrup was over ice cream. They visited the shack Sunday morning with their parents. Neither family had participated in Maple Sunday before, and they decided to visit a local producer. Smith built his sugar house in 1998, and his family taps around 600 trees on 6 to 7 acres. Before that, his sugar house was the “Blue Tarp Special,” a temporary structure under a tarp. The family offered samples of vanilla ice cream with maple syrup, and it sold its maple products like syrup, candy, cream, maple-covered nuts, chocolate and cotton candy. 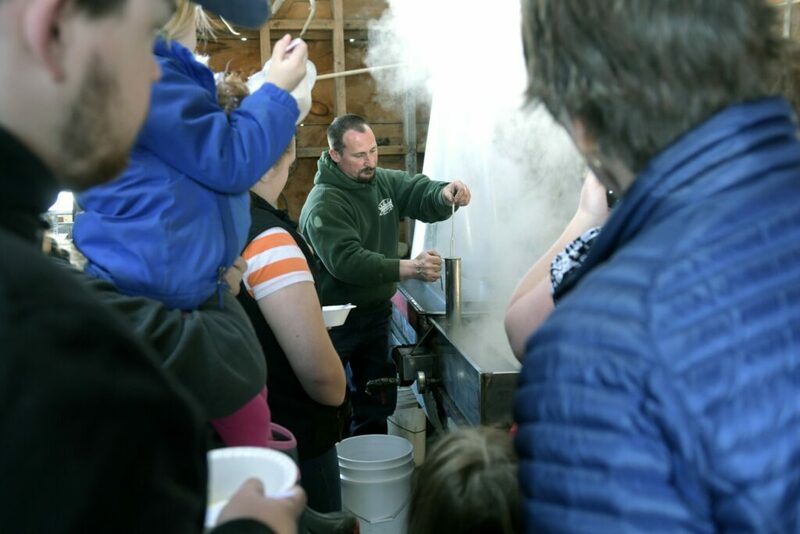 Maple Sunday was just the right weather for collecting maple sap, with the temperature in Central Maine around the 40s (the sweet spot, Smith and Chadwick said). However, Smith and Chadwick had only just started collecting sap with regularity. Smith said his sap had been running slowly or was non-existent this season. “Ordinarily, I can start collecting sap during February vacation,” Chadwick said. This year, she didn’t harvest enough to boil during the week. Smith ordinarily sells his products fresh, but this year he had to sell carryover from last season. Chadwick said her backup plan was to tap more trees, but just in case, she had a reserve of syrup from previous years in order to continue to distill spirits. “If it picks up, it could still be a good season,” Smith said.